A Funny Thing Happened on the Way to the Forum (1966). Monty Python’s Life of Brian (1979). History of the World, Part I: Roman Empire sequence (1981). "Monica Cyrino's Big Screen Rome is a very welcome addition to the few texts available for courses that use film in the teaching of ancient Roman culture and civilization. Her scholarly, highly readable, and well-structured treatment of nine key films on ancient Rome brings together all the information necessary for the understanding of these films and the historical period they cover." Big Screen Rome provides students and teachers alike with the cinema studies details, the historical and cultural backstories and the critical interpretations which they both need to see and feel, through films, the connections between the ancient and the modern worlds. Professor Cyrino brings to this very personal selection of nine films the sensitivities of a devoted teacher, scholar and fan of the lavish historical epic. 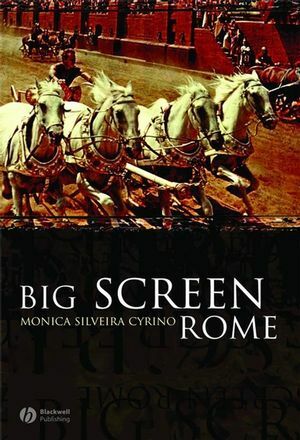 "In Big Screen Rome, classical historian Monica Silveira Cyrino combines her passions for Rome, cinema and the ancient world in a user-friendly and enjoyable manual focusing on nine well known films that use the site of ancient Rome to explore contemporary issues ... It differs from previous volumes on the ancient world and cinema in its textbook-like layout, making it easily accessible to students, teachers and general readers with an interest in history ... The book does a good job in demonstration how the values, rhetoric and politics of ancient Rome have persisted as Universally important models which offer useful analogies for the exploration of the nature of power and ideology in 20th century America." "A welcome and timely addition"
"Big Screen Rome is written in a pleasant, jargon-free style and is immensely readable. This book should be required reading in any course dealing with images of Rome in modern film."